For info, phone is 415/567-1011 Ikenobo office. Program will feature koto students of Shirley Kazuyo Muramoto and Brian Mitsuhiro Wong, performing a variety of koto numbers. Koto students include: Felicia Kazuou Bock, Sydney Paderna, Perry Cheng, Miles Cheng, Kiyomi Nomura, Mika Mar, Yasmin Peled, Kathryn Hobart, Isabella lew, Brenden Landis. Sixty-four years have passed since the end of World War II and the incarceration of approximately 110,000 Japanese nationals and Japanese Americans in "relocation camps." Though much has been researched and written about what happened in these camps, the story of the brave artists who practiced and taught Japanese traditional arts remains a "hidden legacy." For one performance only, an historic event featuring actual artists who taught and learned Japanese traditional arts in these camps during this period will be presented in performance and discussion. The arts of odori (Japanese classical dance), Japanese music of nagauta shamisen (vocal with the shamisen instrument), biwa (5-stringed lute), koto (13-stringed zither) and Obon odori will be represented. Throughout the program, which will also feature historical photographs, information about the artists who taught in camps and how they were able to sustain their arts in such depressed circumstances will be highlighted, as well as the impact these teachers have had on present day artists and future students. "The reason for organizing this concert," stated Shirley Kazuyo Muramoto, granddaughter of internees who encouraged the study of the koto at the Topaz and Tule Lake internment camps, "is that the subject of Japanese traditional music and dance in the camps has been largely overlooked. There appears to be a lingering stigma about this chapter of camp life, possibly due to the fact that practicing Japanese traditional arts in the camps was considered 'un-American' or disloyal, so many former internees continue their silence on the subject." 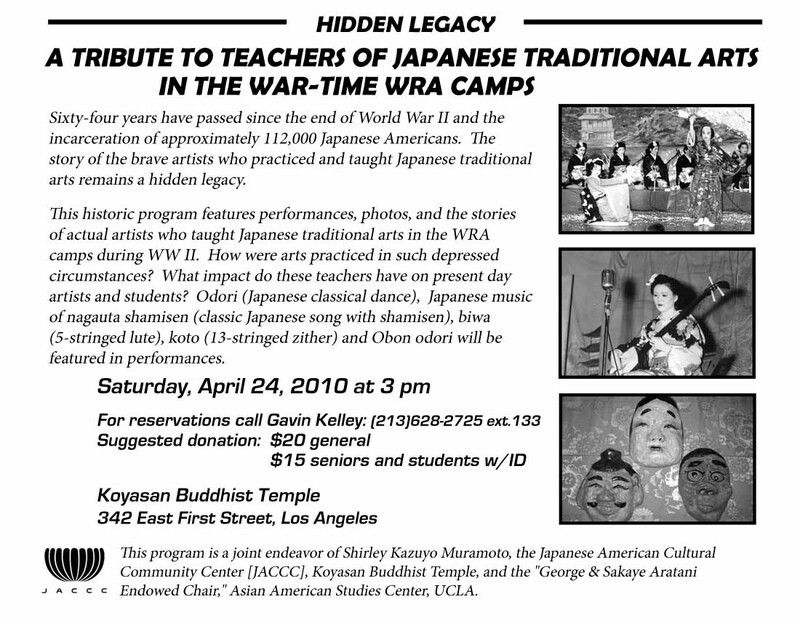 This program is a joint endeavor of Shirley Kazuyo Muramoto, the Japanese Cultural Community Center [JACCC], Koyasan Buddhist Temple, and the "George & Sakaye Aratani Endowed Chair," Asian American Studies Center, UCLA. Shirley Kazuyo Muramoto and Brian Mitsuhiro Wong will be teaching a koto class at Glenview Elementary School in Oakland, Spring semester 2010. It is an after school class open to students from Kindergarten thru 5th grade. There might be a few openings. If you are interested, please call at 510/482-1640 by the first class, which starts Monday, January 25th.